Do you have a dog that use to be white? A whitener and color enhancer with Aloe, Vitamins A,D and E, Panthenol and Jojoba. Now your pet will have a beautiful coat without the drying and irritation caused by many detergent shampoos. 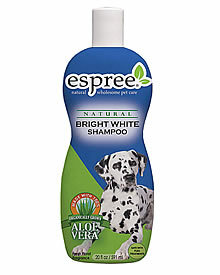 Espree Bright White Shampoo whitens and brightens without the use of bleach and harsh chemicals. Advanced technology color enhancers have been added to restore and enhance the natural coat colors. This aloe based formula works to remove dirt, oil accumulation and difficult stains. Our Bright White Shampoo has natural optical brighteners that remove dirt and stubborn stains to reveal a beautiful coat that may have you reaching for your sunglasses!